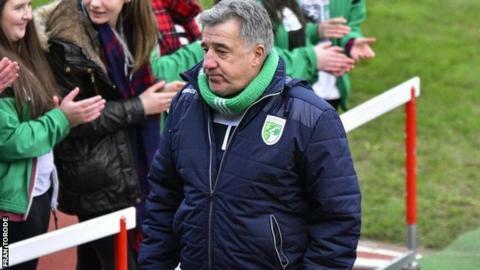 Guernsey FC are capable of gaining promotion and being competitive in the Isthmian League Premier Division, says first-team coach Colin Fallaize. The club has slipped out of the Division One South play-off places this month after a run of four defeats in the last five games. "We're still competitive and I truly believe we can get out of this league," Fallaize told BBC Radio Guernsey. "This is just showing how difficult a league this is to get out of." Guernsey travel to relegation-threatened Chipstead on Saturday as they aim for a first win since the end of last month. "The level above is where I believe our ultimate challenges would be or there'd be serious changes in what we do to go further than that," added Fallaize, who has been Tony Vance's right-hand man since the club was formed in 2011. "I believe we've got the ability to compete in both leagues, and I don't think there's a massive amount of difference between the two leagues. "It's a very competitive league full stop, but I think we can get out of it," he added. Read more on Premier League: What are the top questions asked about your club?